Walter Edmonds memorialised Father Paul Washington of the Philadelphia Church of the Advocate, on the side of a building in the Strawberry Mansion district of Philadelphia in 1990. 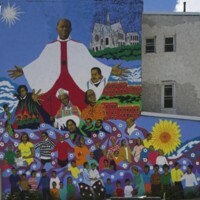 Father Washington was a prominent social activist in the area of Philadelphia.The creation of this mural is a good example of the call-and-response relationship generated by communities. After Walter Edmonds painted the mural Father Paul Washington, local residents were not satisfied with the likeness. As a result, Washington’s face was repainted by artist Stuart Yankell. Washington stands with arms outstretched surrounded by other local and famous heroes, including the antislavery leader Frederick Douglass. During the Civil Rights Movement, African American activists held rallies and conventions at the Church of the Advocate. But people started to notice the absence of black figures from the church artwork. Father Washington remembered: “there were people who came into the church, and as they looked around they saw nothing and no one, including the figures in the stained glass windows, with whom they could identify. Everything they looked at was white, white, white. 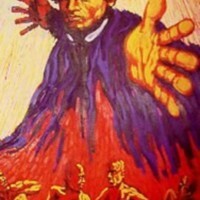 ‘How can we look at this white image for our liberation when it is our experience that it is the white man who is our oppressor?’" Upon hearing these questions, Father Washington realised that “we could see the black experience revealed and defined in religious terms, and find parallel situations in what we read in the Old Testament every Sunday.” He commissioned a series of murals for the side of the church, painted by Walter Edmonds and Richard Watson, that show parallels between the experiences endured by Hebrew slaves in Egypt and those suffered by African slaves in America.